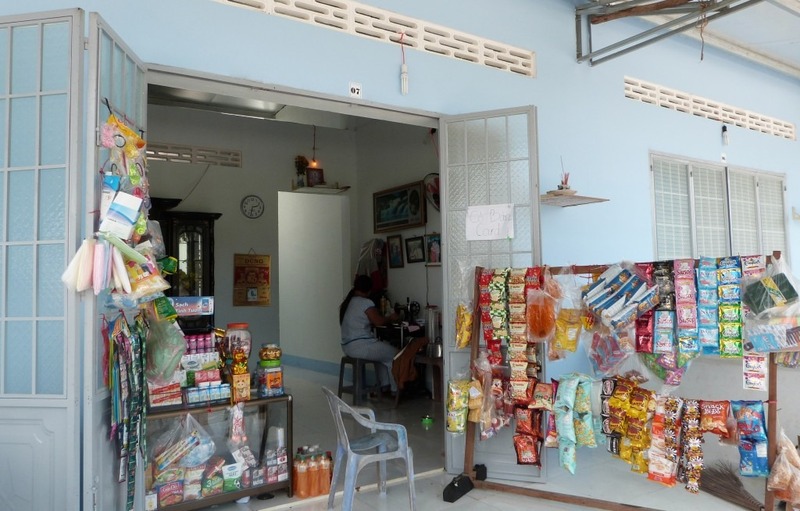 New lives have started in the Vietnam POSCO Village in Tan Hoa commune, Tan Thanh district, Ba Ria-Vung Tau province since the first 26 households have recently moved in. In another part of the village, new houses are continued being built so that more and more vulnerable families will also have decent homes of their own. 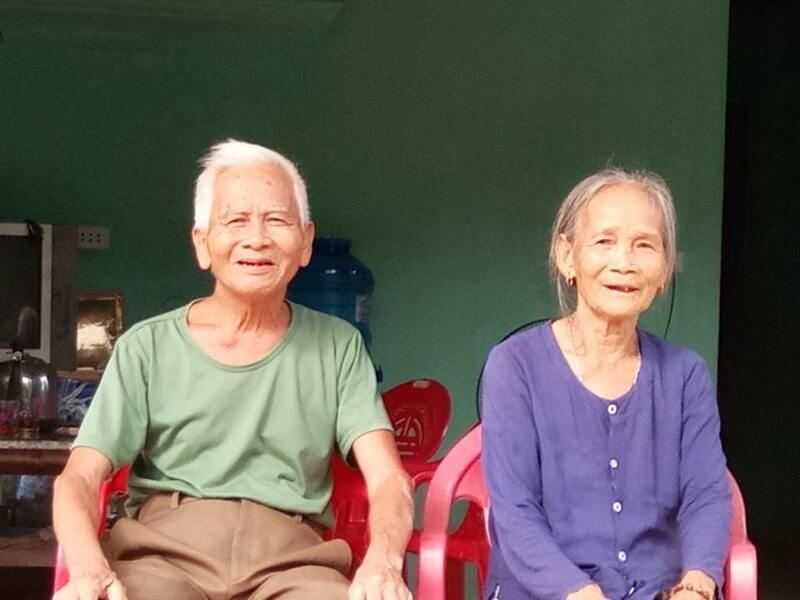 In total, there will be 85 families assisted to move in decent homes with clean water and attached toilets in the Vietnam POSCO Village, a project funded by POSCO and supported by Habitat for Humanity Vietnam. 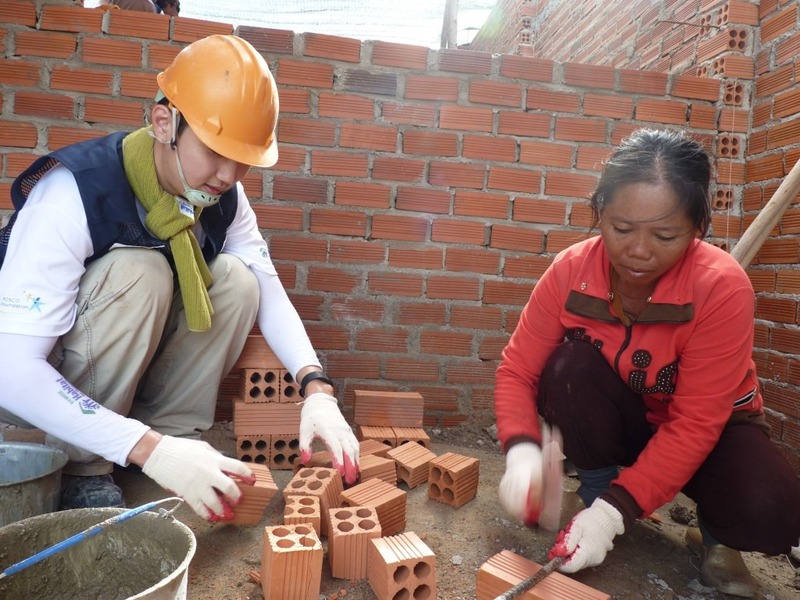 The atmosphere in the village has always been busy since the ground breaking ceremony on November 2014 yet whenever a volunteer team comes to help build houses, it’s like a gentle summer breeze to the daily life of the local people. 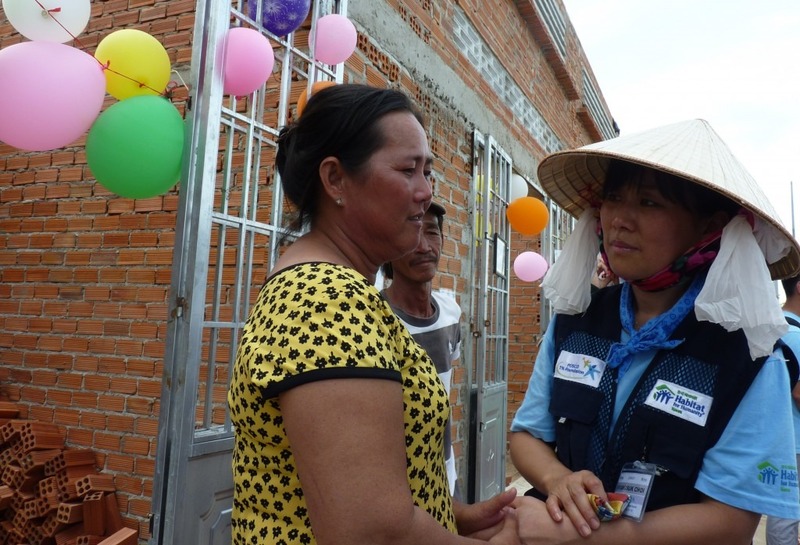 Lately, around 45 POSCO staff from Korea have joined hands with Habitat for Humanity Vietnam to build 6 houses for 6 low-income families in Tan Hoa commune. They teamed up in 6 different groups and each team was responsible for building 1 house in 5 days. It might be strenuous to take part in building especially for some volunteers who have built for the first time; nevertheless, they all tried hard and paid much attention in what they were doing. As learning about struggling lives of the home-partners, the volunteers understood what a decent home meant to them. 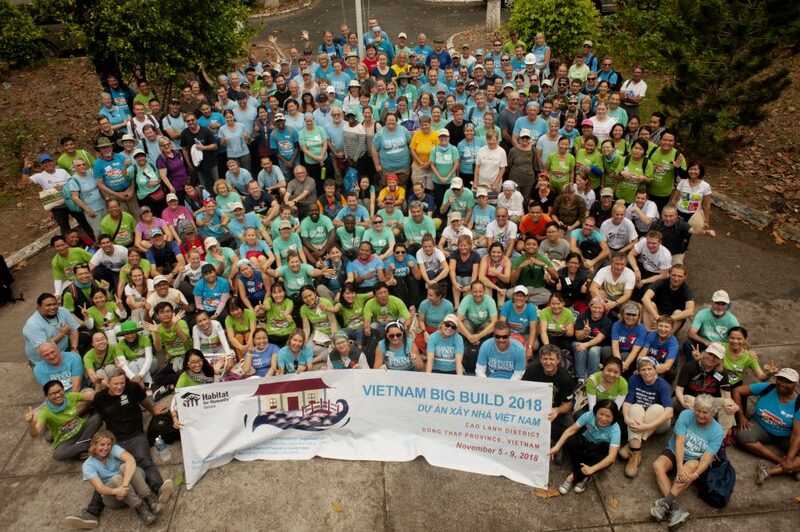 Together with the volunteers, on August 5, Mr. Yun Yang Su, General Director of POSCO Vietnam and Ms. Kelly Koch, Country Director of Habitat for Humanity Vietnam joined with the team to build alongside the home-partners. 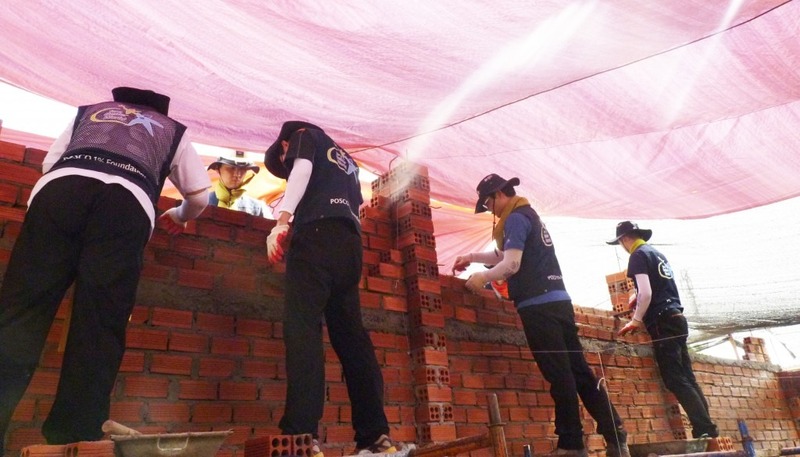 For POSCO employee volunteers as well as the home-partners who were going to obtain the new homes, the build event was like a festival. They cheerfully worked together and talked to each other about their lives and family despite different languages and culture. Laughter and smiles were in the air. Some of them became friends in just a few days. Building can be challenging; however, if you do it with your heart, it would be exciting and fun, particularly when you do it with your friends. Indeed, the volunteers and home-partners have made beautiful moments that they would long remember. As time went on, the 6 houses was in shaped as planned and here came the farewell. The build has come to an end successfully after a week of hard working and joy. 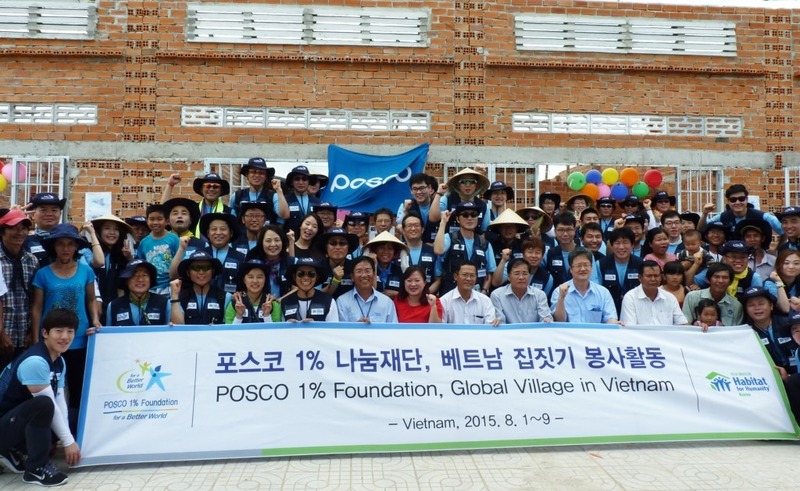 POSCO employee volunteers have returned to their work and daily life back in Korea but what they have done will remain as stable as the houses they built. The same applies to the home-partners who will never forget their kind Korean friends. This is a demonstration of Habitat for Humanity’s mission which is bringing people together to build homes, communities and hope.